What's the point? : This place was damn near perfect. A beautiful, tastefully furnished apartment in a sweet historical building on Laurinska, which is a picturesque, pedestrianized street right smack in the middle of the historical center. The only real flaw was that the kitchen sink was kind of small, making it potentially difficult to wash large pots or baking dishes. But we could've lived with that. Besides, it had a dishwasher. Everything else about this apartment was perfect. Big beautiful windows, hardwood floors, a stylish looking kitchen with groovy red tiles, and super nice furniture, all for the same rent that we currently pay, including all utilities and even internet/cable. Wow! So, when we told the realtor we'd take it, he revealed that someone else had already agreed to rent it, but hadn't signed the lease yet, but that in all likelihood it was a done deal. So, um, what in the hell were we doing there, then? Well, you never know, he said. Sigh... Seriously, only an imbecile would back out of renting a place like this. 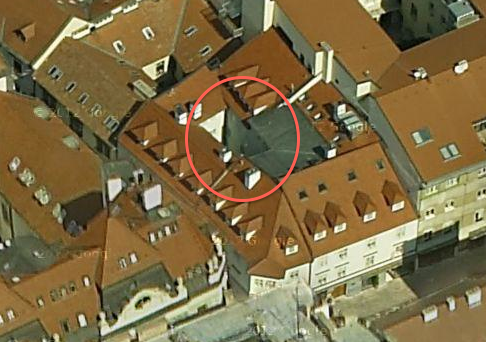 Claustrophobic: Located in an old, medieval-era building on the corner of Laurinska and Ursulinska, across the street and a few doors down from the apartment mentioned above, and in the same building as the Oxford Bookshop, this apartment actually had a lot going for it. Nice and tasteful furniture, reasonably spacious, great hardwood floors, etc... This place had been previously used for short-term holiday rentals, but the owner wanted to switch to a long-term rental situation. But the deal-breaker? All of the windows of the 2nd floor flat looked out into the building's interior courtyard, which was really more of a glorified air shaft or light well, as it was far too small to really be considered a courtyard. That means when you looked out the window, all you could see was the wall across the way - which was at max 10 feet away - and right into someone else's apartment. Bummer. The corner of Laurinska and Ursulinska. An aerial view of the building on Laurinska, where you can see the tiny "courtyard"/air shaft that I've circled in red. Beds and hair everywhere: This next apartment was in the same building, owned by the same person, and had also been used as a rental for short-term stays. But it was much larger than the first - palatial, actually, and with rent to match, of course. But we thought we'd check it out anyway, since we were there. The windows actually had street views onto Ursulinska. But what made this apartment worth mentioning was a matted wad of long hair stuck to the bathroom counter and dirty q-tips on the floor. I mean, come on, would it really have put them out to tidy up the place and make it look more presentable? Also off-putting was the fact that the apartment had beds everywhere. There were 2 or 3 single person beds stuck in every available corner of the living room, while the bedroom also had an extra bed along the far wall. Here's an idea: how about ditching all the crappy extra beds! Because I guarantee you, unless you're specifically trying to rent your flat to a large group of students, you're not going to attract any potential tenants with the vacation rental look. Myopic landlord: We liked this place. It was located in one of our very favorite neighborhoods, near where Stefanikova and Palisady intersect, where there are several blocks lined with beautifully ornate 19th century facades. This apartment had a lot of nice, old-timey details (like intricate woodwork on the door jambs, massive beautiful solid wood doors), very high ceilings, and was fairly spacious, with a nice big kitchen and an airy living room. Although it was at quasi-ground level, the windows were probably about 7 feet off the ground, so it's not like people walking by could peak into the place. (Besides which, it was a pretty mellow street). And speaking of the windows, they were huge, old, and beautiful - and let in lots of natural light. Terezia had some reservations about the ground floor, but despite that, we decided we'd take it. So, what went wrong this time? We actually saw this place back in October, and when we said that we couldn't take it until December 1 because of our current lease, the owner decided that was too long to wait, and opted to gamble on someone else being both interested and able to move in sooner. Of course, at the time of writing nearly a month later, this apartment is still available, and they've even decreased the rent by 50 euros. So stupid - had they agreed to let us take it in October, they could've locked us in at a higher rent. But now that the rent has gone down and Dec 1 is fast approaching, maybe we'll get in touch again.